Fans of the French animated series can now get their vinyl fill thanks to the Funko Pop Miraculous: Tales of Ladybug & Cat Noir figures! A more recent take on the superhero genre, main characters Marinette Dupain-Cheng (a.k.a Ladybug) and Adrien Agreste (a.k.a Cat Noir) are teens in Paris who protect their city from harm. The wordy title of the show is usually shortened to just Miraculous Ladybug. 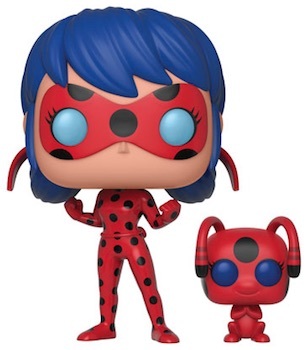 The Funko Pop Miraculous: Tales of Ladybug & Cat Noir figure for Ladybug vividly displays her blue hair. She wears a red jumpsuit and mask with black spots. Accompanying Ladybug is her Kwami, Tikki, who provides her special hero abilities. The cute creature also carries ladybug coloring. Shop Funko Miraculous Ladybug Figures on Entertainment Earth. Fighting alongside Ladybug is Cat Noir, ready for battle. He is dressed in all black with cat ears nestled in his blonde hair. Like Ladybug, Cat Noir receives help from his Kwami, the cat-like Plagg. Plagg joins Cat Noir in his main figure release. Attempting to best the duo is the villainous Hawk Moth. 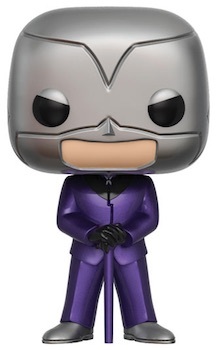 The figure includes a silver mask over his entire head with a purple suit and cane. Black gloves and silver shoes complete the evil look. 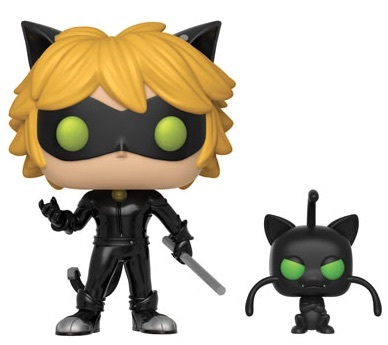 Part of the London Toy Fair 2018 reveal, visit this page in the future for more details about Funko Pop Miraculous: Tales of Ladybug & Cat Noir. Specific box numbering will be updated. Final box images will be added. Pre-Order Miraculous Ladybug Pop Figures on Entertainment Earth.